The Constitutional Council earlier ruled the law backed by Mr Sarkozy infringed on freedom of expression. The bill, which covers the mass killing of Armenians by Ottoman Turks during World War I, was passed by both houses of the French parliament. Turkey has welcomed the ruling. The legislation had strained relations between the two countries. Noting the "great disappointment and profound sadness" of the law's backers, Mr Sarkozy's office wrote in a statement: "The President of the Republic considers that [genocide] denial is intolerable and must therefore be punished. "He has asked the government to prepare a new draft taking into account the decision of the Constitutional Council." Turkish Foreign Minister Ahmet Davutoglu said the cabinet would meet to consider whether to restart economic, political and military contacts with France which were frozen after the French parliament passed the law on 23 January. 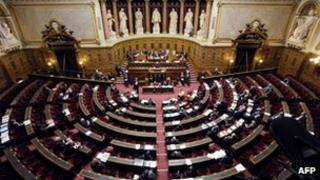 France's Constitutional Council said in its ruling that "by punishing anyone contesting the existence of... crimes that legislators themselves recognised or qualified as such, legislators committed an unconstitutional attack on freedom of expression". More than 130 of senators and MPs across the political divide had appealed to the constitutional court to examine the bill, in a move welcomed by Turkey. France already recognises the killings as an act of genocide, but the new law would have meant that anyone denying it faced up to a year in jail and a maximum fine of 45,000 euros ($57,000). Armenia says up to 1.5 million people died in 1915-16 as the Ottoman empire split. Turkey, which rejects the term "genocide", has said the number of deaths was much smaller. Defenders of the bill argued it covered all acts of genocide. The vote last month spurred angry protests in both in Paris and Ankara. The Turkish government suspended political and military co-operation with France. The Turkish government argues that judging what happened in eastern Turkey in 1915-16 should be left to historians, and that the new French law would have restricted freedom of speech. The killings are regarded as the seminal event of modern Armenian history, a tragic bond uniting one of the world's most dispersed peoples. Among the other states which formally recognise them as genocide are Argentina, Belgium, Canada, France, Italy, Russia and Uruguay. The UK, US, Israel and others use different terminology.